I’ve been living it up lately. Every day at work I eat my lunch. And every day when I finish eating I walk up to the check-out line of the company cafeteria and pay for a chocolate chip cookie that is about four inches in diameter and a fountain soda. And it always hits the spot. This daily treat probably runs me about 600 calories. Under normal circumstances such a delightful sin might be a once-a-month occasion, if that. But lately I’m doing it every day. Why? Simple. … Because I can. Nursing a baby is a huge commitment and a lot of work. The bonuses are two-fold. Most importantly, it’s good for my baby. Secondarily, the calories it burns afford me the opportunity to eat more or less whatever I want. This doesn’t mean that I eat junk food every day. On the contrary, I’m aware that whatever I eat so does SSP. So I take care to eat a balanced diet that is good for both of us. But I justify my “cookie and a Coke” habit with the premise that I can take such liberties with my diet only for a limited time, so I had better take advantage while I can. Hooray, I thought. Bring it on! Then 60 Minutes had to go and rain on my parade. Their recent piece on the toxic nature of sugar was a total buzzkill for me. The net of it is this: “When a person consumes too much sweet stuff, the liver gets overloaded with fructose and converts some of it into fat. Some of that fat ends up in the bloodstream and helps generate a dangerous kind of cholesterol called small dense LDL. These particles are known to lodge in blood vessels, form plaque and are associated with heart attacks.” In addition to the heart disease risks, sugar is associated with increased cancer risks and has been shown on fMRI to be as addictive as cocaine. Then The Huffington Post doubled down with a pair of articles (here and here) endorsing the 60 Minutes piece and echoing the evils of sugar. So what’s a girl to do? What is any of us to do? Should we heed this doomsday – and scientifically substantiated (grrrrr) – news? Or should we take it with a grain of salt? 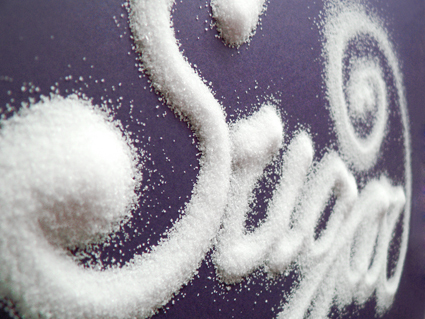 All of this new research on sugar is depressing at best, foreboding at worst. Are we to believe that sugar is like tobacco, and any amount of consumption is to be avoided at all costs? Or is it more like alcohol, something that can be damaging and addictive when consumed irresponsibly and in excess, but which can also be enjoyed in moderation without any real harm? If I were overweight, or diagnosed with diabetes or hypertension then I would not sit here wondering whether or not I should ditch my daily sugar high. But I’m really healthy. My cholesterol level are great. I exercise daily. I drink lots of water and eat lots of vegetables. At my most recent physical my doctor told me that I am “built to last.” Given all this, can I afford to to continue my sugar-laden indulgences? Or is the fact that I can afford the calories irrelevant? I can tell you this: as soon as SSP is weaned I will drop this habit. My soda consumption will drop back to about one a week. And my dessert proclivities will be substantially adjusted as well. But can I afford to throw caution to the winds for the next seven months? Or do I need to dial it back now? Given what I’m learning about sugar I’m inclined to modify my habits sooner than my baby’s first birthday. (Also, the novelty of my cookie/Coke habit is slowly fading.) But at the same time I want to believe that in the context of an otherwise completely healthy lifestyle, it’s not that big a deal. It’s my one vice and it’s temporary. But I care a great deal about my health. Truly, I’m torn. This entry was posted on Tuesday, April 10th, 2012 at 5:00 am	and is filed under Choices, Health. You can follow any responses to this entry through the RSS 2.0 feed. Both comments and pings are currently closed.